It might seem odd that, given that The Secret Garden is one of my all-time favourite books, if not my number one favourite, it's taken me so long to read another famous title by Frances Hodgson Burnett. Actually, I must have read A Little Princess some time in the dim and ancient past -- or if not A Little Princess itself, its predecessor, Sara Crewe. It scarcely seems possible that I could have lived so long and dodged it entirely. Certainly the story was very familiar. Young, indulged Sara is left at a London school by her doting father, who then disappears back to India. Years pass, during which absent Papa showers Sara with gifts from afar, then tragically dies. 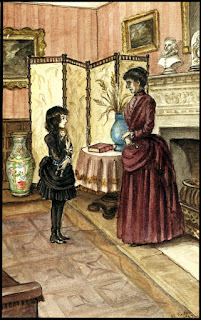 Now plunged into penury, Sara is at the mercy of cruel Miss Minchin, and from her exalted position of richest pupil, she becomes a virtual slave, banished to the attics and half-starved while she works her fingers to the bone about the house, as well as tutoring the younger pupils as an unpaid teacher. But Sara, with the aid of her vivid imagination, always maintains her dignity and generous, loving spirit; and she is duly rewarded by the appearance of a new foster father (I was almost expecting dead Papa to come back to life, but Burnett just shies clear of this option -- just!) and a suitably fairytale ending. A Little Princess is a Cinderella story, of course, but as I read I kept hearing echoes of other books, for which this story was surey a template. My beloved Wolves of Willoughby Chase (Joan Aiken) has tons of Little Princess in it -- the wicked schoolmistress, the tortured orphans, the magical arrival of longed-for warmth and comfort just when all seems lost. It's one of the most satisfying stories there is, which is why it keeps appearing: virtue in suffering receives its just reward. Sara is unfailingly kind, unfailingly brave, a princess in exile, and at last she is welcomed into the loving home that she has been so cruelly denied. It struck me that there were similarities between this book and Little Lord Fauntleroy, another turn-of-last-century Burnett hit. Again, an almost perfect child is rewarded by fate by being showered with wealth, though in the little lord's case, his poverty and suffering all takes place before the book starts. The thing is, Sara is spoiled rotten by her adoring papa, her every whim indulged, but it doesn't actually spoil her; she remains thoughtful, loving and courageous, even when all her riches are stripped from her and she has nothing. Mary Lennox, in The Secret Garden, on the other hand, starts off as a most unpleasant child: sullen, sour and angry. The difference is that Mary has been neglected all her life by her beautiful, glamorous parents; she has never been loved. I wonder if Burnett's subtext in all three books was the same. Victorian era children were often considered to be in danger of 'spoiling' if their wishes were 'indulged' - strict discipline, self-control and punishment were the order of the day. But Burnett's most loving, and loveable*, children are also those most showered with love. Even indulgent, excessive love can't ruin them; in fact, it strengthens them, and enables them to give love to others. Modern psychology would surely agree. *We could argue that Lord Fauntleroy is actually an obnoxious little snot, while Mary Lennox is loveable despite her prickly exterior, or even because of it; but we are clearly supposed to find Fauntleroy utterly charming, so let's leave that be! What's more fun than a book launch? 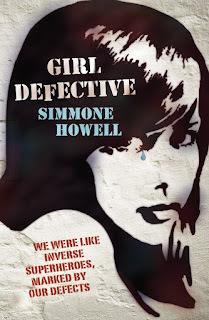 A DOUBLE book launch, that's what! Consider yourself invited to come along to Readings Carlton to join Simmone and me as we launch each other's new books. Well, I finally caved. After a long resistance, I've finished my first book on an e-reader. 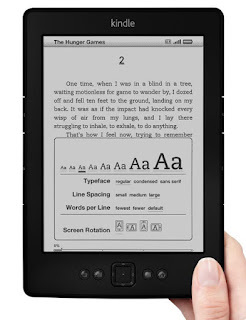 And I plunged in the deep end: for my first Kindle experience, I chose The World Until Yesterday, by Jared Diamond. I won't be critiquing the actual book here (which has been ably done by others, including Drusilla Modjeska), only the Kindle experience itself. First, the positives. This was a very big book -- about five hundred pages. That's a lot of weight to lug around. But I could slip the Kindle into my handbag (the small one!) and take my book on the bus and to Alice's tutoring session, without straining my back, and I could read anywhere round the house without getting sore arms from propping up a huge great heavy volume. Also, the Kindle version was VERY cheap. I may not have bought this book at all had I not idly looked it up on the Kindle store and had my mouth not dropped open at its scandalous cheapness. I don't know how much of this teeny amount goes to Mr Diamond. So I guess this is a positive for me, but not necessarily for him. On the other hand, at least I did buy it, which I probably wouldn't have done otherwise. Once I'd worked out how to operate the links in the text, I could navigate the book fairly easily -- look up pictures and footnotes, and return to my spot immediately. The little bar along the bottom of the screen told me, not how many chapters or pages I'd read, but the percentage of the text I'd consumed, which I found initially disconcerting. I'm used to measuring my progress by seeing how many centimetres of page thickness fall on either side of my bookmark. What does 37% mean? I had no real sense of how far there was to go. Which brings me to the negatives -- which are pretty intangible, I must admit. I missed not being able to flick through pages and idly scan for things that interest me, like references to Australia, to stop and browse and dip and swoop ahead. I missed not having the pictures embedded in the text. I missed the physicality of the book -- I still have only the haziest idea of what the cover looks like. Most of all, I fear that the book's contents won't stay with me. Maybe this is just me, but I find that the physical shape and look and feel of a book is crucial to recalling the reading experience and the story or argument within. I remember how it felt to pick it up, the colours of the cover, the thickness of the spine, the look of the font and print on the page, where I was when I read it -- all this is intrinsic to remembering what I read. I'm afraid that, unanchored to these physical memories, the contents of the book will drift away from me. If every book I read on the Kindle looks and feels and smells like just another Kindle book, will I be able to hold onto any of them? Or is this just the world will be from now on? I have to say that I enjoyed my first time, despite my misgivings. But now I'm hankering for a Real Book. My first copies just arrived. 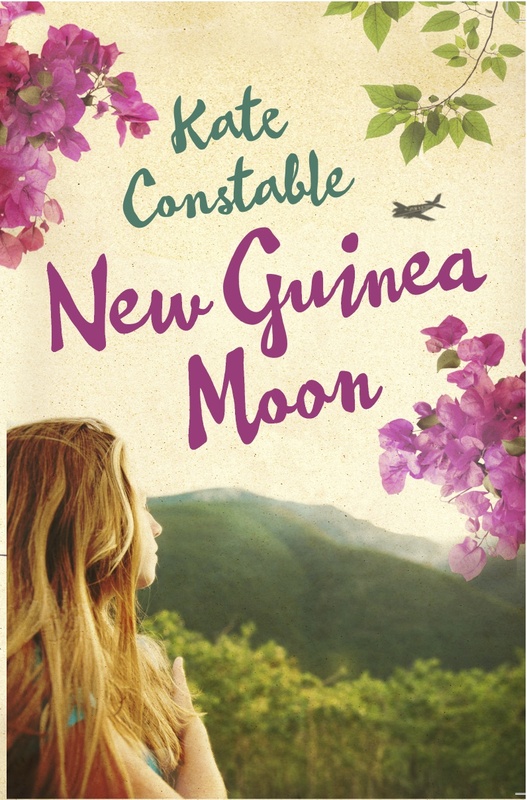 New Guinea Moon is my ... um... tenth book (crikey, that came up fast! ), but the thrill of handling the first copy, holding it up to the light, thumbing though the pages, seeing your words transformed and packaged into a Real Book -- well, that never wears off. Official publication date is 1st March, and yes, there will be a book launch around that time. Details to follow, and you're invited!